Will the ground covers enhance the garden bed, or make it too crowded? Do they require space that receives 6+ hours of sunlight, or do they prefer to be tucked underneath the cool canopy of a tree? Will the color and texture of the ground cover compliment or contrast the larger plants surrounding it? Do you need something that will spread far and wide, or just enough to add a bit of color and interest to the space? 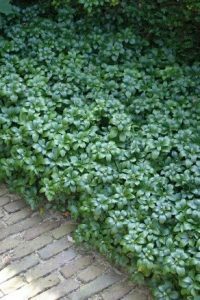 Ground covers are also great with helping to manage erosion and may be part or all of the solution if you are seeing bark dust or soil eroding onto walkways or driveways. They can help stabilize surfaces so they are less likely to be moved by gravity, water, or a creature’s footsteps. 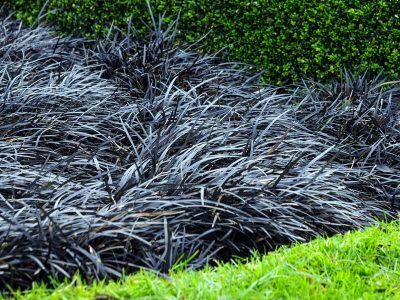 If you are planting near a neighbor’s yard or a natural habitat it’s best to steer clear of ground covers that spread too vigorously, unless you plan to hire a maintenance company or stay on top of them regularly yourself. If you live in the Pacific Northwest stray from using invasive plants such as Vinca, Mint, or Common Ivy, to name a few. 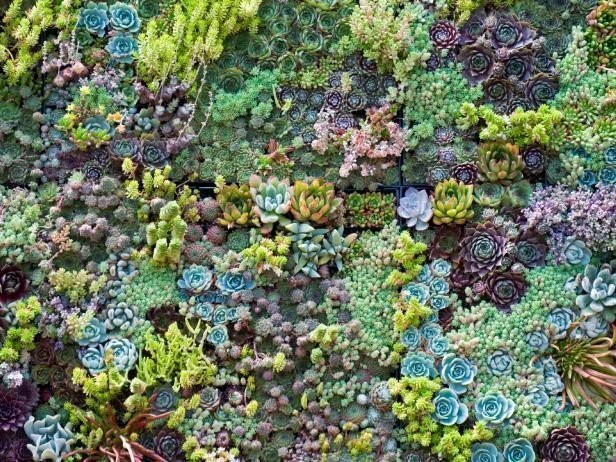 These have a tendency to take over gardens (and sometimes neighborhoods!) and are difficult to eradicate once established. Pachysandra terminalis, Pachysandra: It has large glossy green leaves and it’s great for filling large shady spaces! If you want more color variation look for ones that end in ‘Variegata’ or ‘Silver Edge’. Their streaks of creamy white along the edges of the foliage add a touch of brightness to dark areas! 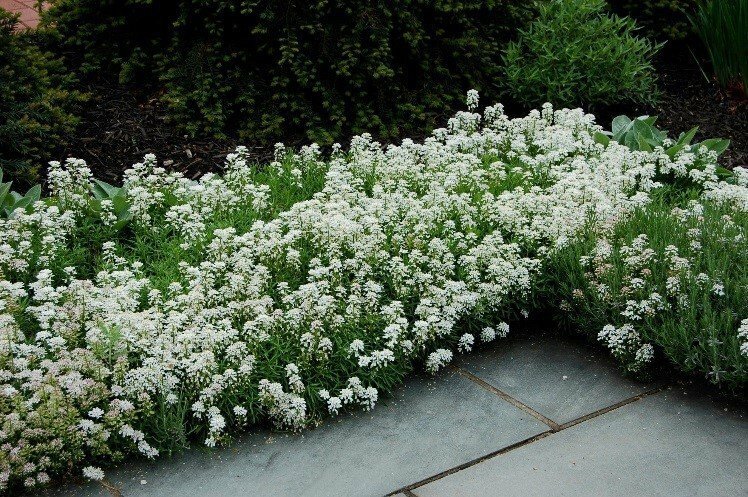 Iberis sempervirens, Candytuft: This is a wonderful year-round ground cover that flowers in the spring and often times again in the fall. The explosive bright white flowers are hard to miss when in bloom, and the foliage maintains its feathery look all year long. This plant has a compact form and won’t typically grow past 18”-2’0” wide. It’s great for tucking in corners of retaining walls, or dripping down sides of planters. Sedum, Stonecrop: Sedums, also known as Stonecrops, come in a multitude of shapes, sizes, and colors giving you seemingly endless options for your dry sunny areas. They look right at home in a rock garden or surrounding flagstone stepping stones- and they’re drought tolerant to boot! A few great varieties are Sedum rupestre ‘Angelina’, Sedum pachyclados, and Sedum spurium ‘Blaze of Fulda’. Ophiopogon japonicus, Mondo Grass: Mondo Grass, also called Monkey Grass or Lilyturf, is a tidy looking plant and stays relatively small, especially the dwarf variety ‘Nana’ (only 2”-4” high!). 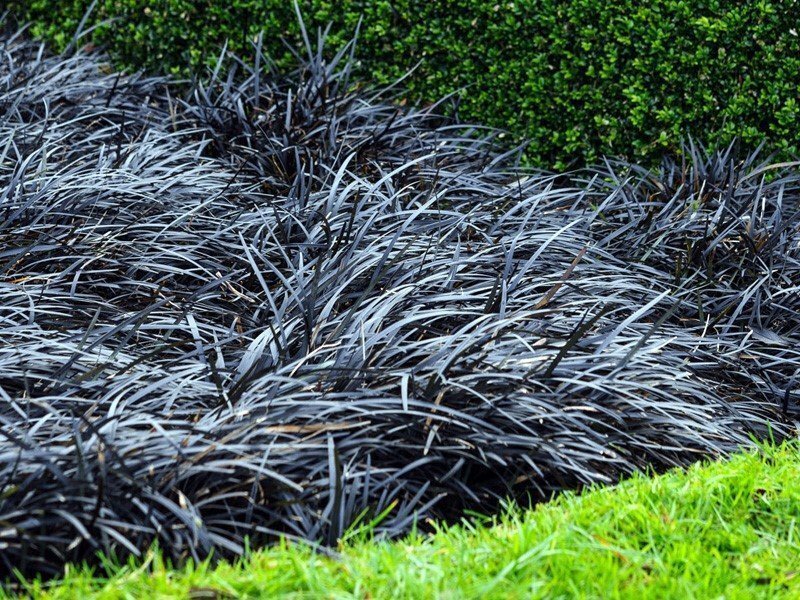 Ophiopogon planiscapus ‘Nigrescens’, or Black Mondo Grass, is also very small, but unlike its green-bladed cousin, its grassy foliage is a dark-dark purple verging on black! Mondo grass is often seen planted in neat rows in ultra-modern style gardens, but this plant is also great for filling in oddly tight spots or surrounding stepping stones. 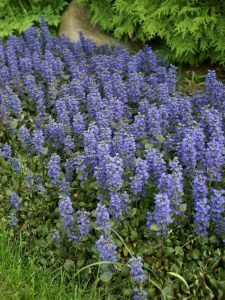 Ajuga reptans, Bugleweed: Bugleweed is happiest in the shade where its dark purple foliage add drama to your garden floor. If you like the purple color, but want to keep the space looking lighter and brighter choose varieties such as ‘Sugar Plum’ or ‘Burgundy Glow’. What really makes this plant special, though, is its showy violet flower spikes in the spring and may very well be the showstopper in your garden! 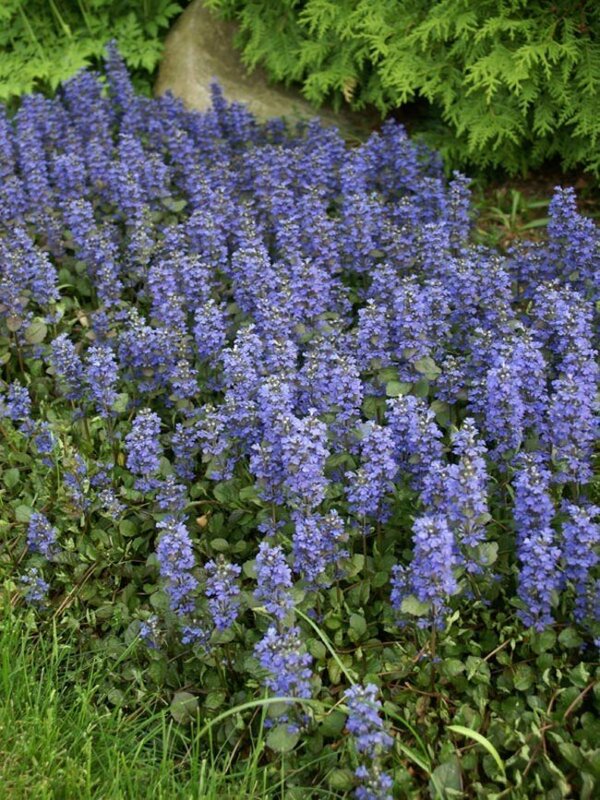 Please note Bugleweed does have a tendency to spread vigorously and is best planted in contained areas.